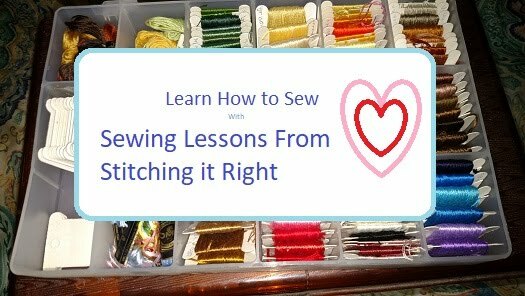 Happy New Year to the Readers of Stitching it Right! Well, if you're reading this, you made it through 2013 with us. Stitching it Right would like to wish you a healthy and prosperous 2014! May the coming year be filled with blessings, peace, and joy for you and yours! Check back often, sign up for email updates, or follow our RSS feed for updates as we have a lot of great information and changes coming for 2014.
and... once again... Happy New Year! Children can get restless and fidgety on a long drive. Packing a busy bag can make the drive to a distant relative's home on Thanskgiving day easier. Imagine heading out on a long drive to a relative's house on Thanksgiving Day. You have to drive, oh, let's say, over an hour to get there. Your children are in the back seat. They don't have anything to do other than look out the window, fight with each other, and whine, "Are we there yet?" By the time you reach your holiday destination you are tired, annoyed, and would really rather just go home. Now imagine a second scenario. You are heading out on the same drive, and it is going to take over an hour just to get there. Your children are in the back seat. This time they have their busy bags beside of them and are anxious to see what you packed for entertainment. Is there a chance the children will still fight and whine? Sure there is, sometimes they just do that, but overall, the trip should go more smoothly. In this scenario you reach your destination needing to stretch, but not nearly as tired and annoyed as you would have been otherwise. Grocery Bag, Tote Bag, or Back Pack? While any kind of bag will work, if you use a tote bag or back pack to contain the activities there is a good chance the children will think it is special. A bag that seals with either a zipper or hook and loop closure will work best. Open bags can dump and send contents sprawling if they tip over. Consider you child's age, personality, and interests when packing a busy bag. Also, consider how long each packed activity might take. If you only pack enough to entertain your child for 15 minutes and the trip will take over an hour, the busy bag will not be very much help with easing stress on the trip. Colored pencils and sharpener - Avoid packing basic crayons or markers because they can make a big mess in the car. Handheld electronics - A Leapster, Game Boy, DS, or any kind of handheld electronic will work. Travel games - Travel games are miniature, usually magnetic, versions of board games, such as Travel Scrabble, Travel Battleship, and others. Sometimes you can even find a generic version of these tiny travel games when shopping at dollar stores. Snacks - While you probably won't want to pack anything too filling if you are going somewhere for Thanksgiving dinner, having something to munch on can help keep a child calm. If you allow eating in your car, try packing one of your child's favorite snacks, a small pack of crackers, or a few carrot sticks. While nothing can guarantee your trip will go smoothly, planning ahead and packing a busy bag can help take the stress out of a long road trip. While you are preparing a busy bag, you might also want to make sure your vehicle's emergency kit is well-stocked. You might also find ideas for main dishes and desserts that travel well helpful. When you have a long drive to get to a Thanksgiving get-together, some desserts will carry better than others. A long car trip can wreak havoc on some desserts. You can either plan ahead by preparing desserts that travel well, or use a frozen dish and cooler to keep perishable desserts cold. Dishes that go in the freezer for several hours before use, such as the Pampered Chef Chillzanne line of dishes, can help to keep food cold and at a safe temperature for consumption for several hours. Some tried-and-true holiday desserts are easy to take on a long trip, making them long-time holiday favorites. Cookies - Cookies, while not the most exciting dessert, travel well. Just layer cookies on a decorative plate or tray, wrap them securely with cellophane, and stick them wherever they fit in the vehicle. Sheet cake - Sheet cakes are long and low in shape. A layer cakecan end up tipping over or sliding apart during transport, but sheet cakes can stand up to a long drive. Brownies - Brownies can be cut and placed on a tray like cookies, or left in the pan and transported flat, like a sheet cake. Baked pies - Baked pies, think apple, cherry, and pumpkin, carry well on a long drive. Cream pies, however, only travel well on a long drive when something is provided to keep them cold. If you plan to serve whipped cream with the pies, that also needs to be kept cold. Some desserts can stand up to a long drive, but only when kept cold. Use both a cooler and a frozen container if possible. Gelatin mixed with fruit - If you are taking gelatin with fruit, make sure it stays very cold so it keeps its shape. Runny gelatin might taste okay, but it's not pretty. Fresh fruit chunks with yogurt dip - Mix a container of vanilla yogurt, whipped cream, and a can of sweetened condensed milk to make the dip. Either place the fresh fruit in an air-tight container, or take it with you and cut it when you reach your destination. If, however, everyone is waiting to eat, they might not like waiting longer for you to cut your fruit. Cream pies and cheesecakes - Make sure cream pies and cheese cakes are kept cold during a long drive. A cooler, a frozen dish such as a Pampered Chef Chillzanne, or both will work. Trifle - Trifles are usually pretty, with layers of cake, pudding, whipped cream, and sometimes fruit in a tall, glass bowl. Make sure, if you attempt a trifle, to wrap it carefully, secure the bowl inside of the cooler so it cannot tip, and keep plenty of ice in the cooler. A little bit of extra preparation can make it easy to safely carry dessert to a Thanksgiving potluck. While you are busy planning ahead, you might also want to pack a busy bag to keep children entertained on the drive, and restock your emergency kit food. Main dish ideas that travel well might also be of interest to you. Taking the main dish to a holiday dinner can be challenging but some potluck entrees carry better than others. If you get elected, or if you volunteer, to take the main part of the Thanksgiving dinner to someone else's home, you need to consider two main things. The first thing you need to mull over is, which main dishes travel well. The second big consideration is, what kind of container or packaging will work best to make sure your entree gets to dinner without dumping all over your car. Non-Traditional or Traditional Thanksgiving Dinner Menu? Some people do not especially like turkey, and the company is really what the day should be about. If you don't want to make a turkey, and the other Thanksgiving guests are not "into" turkey, consider another type of main dish. If the get-together you are attending is not a traditional Thanksgiving dinner, you have a lot of extra main dish options. Lasagna - Lasagna travels well because it is made in a long, low baking dish. If you have one of the glass baking dishes with an insulated carrying case, it will most likely still be hot when you reach your destination. Another option is to prepare it and take it unbaked, and then bake it when you reach your destination. Roast beef, ham, meat loaf - These are just a few alternative meat suggestions, you can really pick from anything you like, or even anything you find on sale. You can transport meats in a slow cooker or in a baking dish with an insulated case. Hot dogs, shredded chicken, sloppy joes - Sandwich meat is easy to carry in a crock-pot, and easy to serve, too. Just don't forget the buns. Tacos or fajitas - If you prepare the meat and take it in a slow cooker everyone else can chip in with vegetables, sour cream, and cheese. Then everyone can have fun putting their favorites together. Chicken and noodles - Or any of your other favorite pasta dishes. Avoid tall casserole dishes, unless you have something to wedge tight against the sides to keep the food from spilling out. Pasta with meat makes a filling meal, and everyone else attending the pot-luck get-together can bring desserts and side dishes. Get a big, sturdy roaster that won't tip over. Take your chances with a foil roaster. If the turkey gets there without dumping, you won't have to worry about retrieving your pan before you go home. Slice the turkey; fill a baking dish with a cover and an insulated carrying case to keep the sliced turkey warm. If you have the pleasure, of preparing the main part of Thanksgiving dinner, but you are going to someone else's house, you need to figure out what you want to take, and how you are going to get it there safely. If you have any doubts about keeping the food at a safe temperature while making a long drive, either pick something else to take, or cook it and let it cool, pack it in an air-tight cooler with a lot of ice, and re-heat it when you reach your destination. Some related articles you might find helpful are ideas for: desserts that travel well, busy bag ideas to keep the young ones entertained, and emergency kit food ideas. Patterns are expensive, but once in awhile JoAnn Fabrics has a great sale. You just have to watch and plan ahead a bit. I found a great deal on patterns yesterday at the local JoAnn Fabrics store. McCalls patterns were 5 for $5, or a buck a piece. I bought 5, and my total savings were over $87. When I start stitching them up, I'll review them here and post any workarounds you can do to make them easier. Now, one last question, this is for McCalls and the pattern companies... Why the heck is your selection of men's and boy's clothing patterns so stinking pathetic? Seriously, it's SUMMER WEATHER, why is there not a single pattern available from the big name companies for a pair of men's shorts with pockets. I don't even care if they're the zipper kind or elastic, but there's NOTHING. Boo... Hiss... Sewing pattern company FAIL!!!! I'm building a new upholstery website, Upholstery-Girl, and would like to share a link to it. The site is about sharing information for do-it-yourselfers, people starting their own shops, and to also promote my own professional upholstery work as I prepare to reopen my own shop. If you're interested, I would love to hear your opinions. While I'm hoping you'll think it's awesome, I'm open to criticism, too, because it can only help me make it better. You can leave a comment there, here, or email me at info@upholstery-girl.com. I'll add a link to it on my upholstery page here on this site, too, when I have a bit more time.